What is a Wellhead Protection Area? What is Regionally Sensitive Groundwater? What is an Intake Protection Zone? How Can You Help Protect Drinking Water Sources? What’s Happening in the CSPA? Home → Resources → Living in the CSPA → What is an Intake Protection Zone? 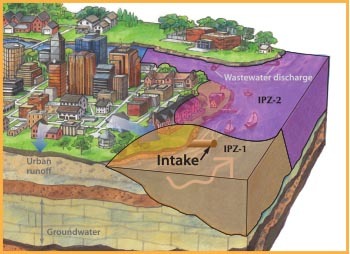 An intake protection zone (IPZ) is an area of land and water around a municipal intake pipe that contributes source water to a drinking water system. An IPZ shows where surface water is coming from to supply a municipal intake at a water treatment plant, and how fast it is travelling toward the intake pipe. IPZ‐1 is the area closest to the intake pipe and is a set distance which extends one kilometre upstream and 120 metres onto the shore. IPZ‐2 includes the on and offshore areas where flowing water and any pollution would reach the intake pipe within two hours. IPZ‐3 is an area where contaminants could reach the intake pipe during and after a large storm. In the CSPA, there is only an IPZ‐3 for the Sydenham IPZ. The size and shape of Sydenham IPZ‐3 is based on the lakes and streams that contribute water to the intake. The vulnerability of each zone for every intake protection zone in the CSPA was determined based on a number of factors that account for how easily contamination could reach the intake pipe. The depth of the intake pipe, its distance from the shore, and how easily contaminants could get into the waterbody were some of the factors used to determine the vulnerability of an intake protection zone. The zones closest to the intake in an IPZ have the highest vulnerability, since there is less time for pollutants to break down and for clean‐up to happen, before the water reaches the intake pipe.